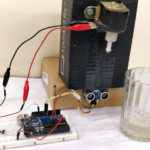 Today we are going to make automatic water dispenser which will save some water from dripping out from the water dispenser. As we know that, About 71% of earth is covered with water, but sadly only 2.5% of it is drinking water. With rise in population, pollution and climate change, it is expected that by as soon as 2025 we will experience perennial water shortages. At one hand there are already minor disputes among nations and states for sharing river water on the other hand we as humans waste a lot of drinking water due to our negligence. 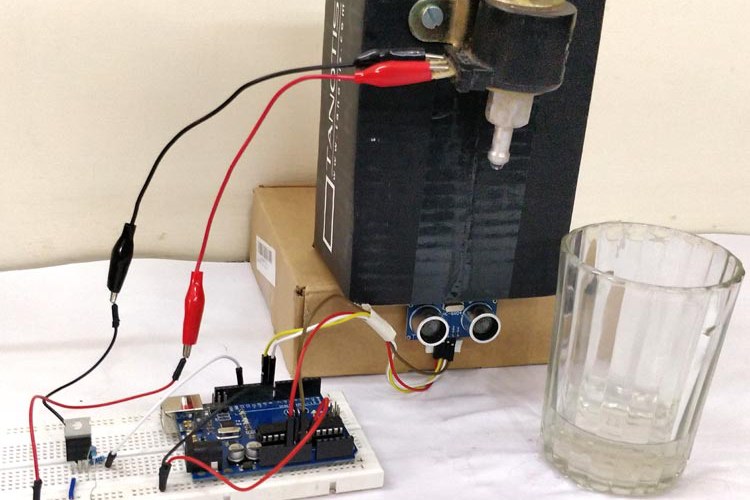 So in this project we will learn to make our own Automatic water dispenser System. 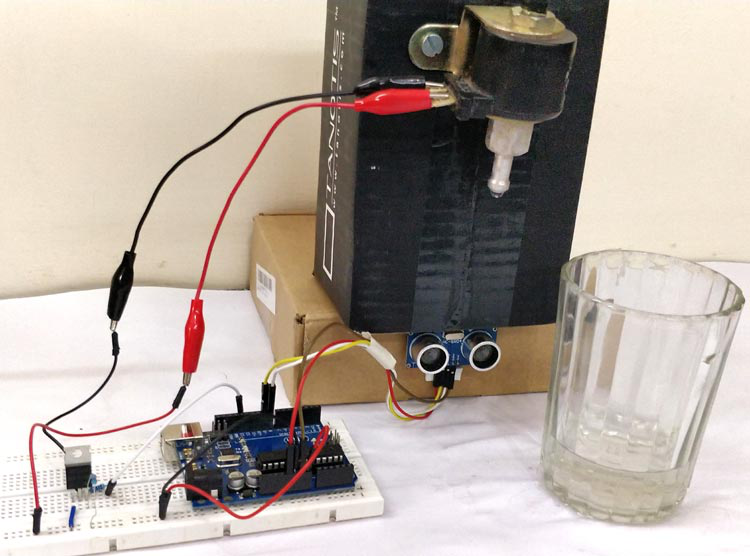 The Concept behind the Automatic Water Dispenser is very simple. We will use a HCSR04 Ultrasonic Sensor to check if any object such that the glass is placed before the dispenser. A solenoid valve will be used to control the flow of water, which is when energized the water will flow out and when re-energized the water will be stopped. 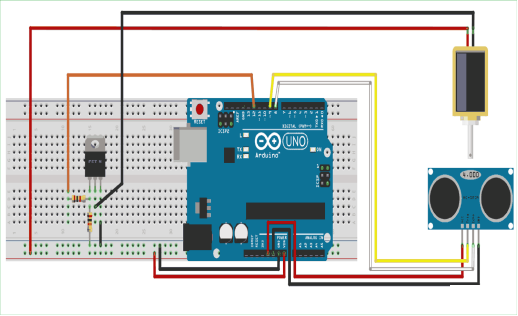 So we will write an Arduino program which always checks if any object is placed near the tap, if yes then the solenoid will be turned on and wait till the object is removed, once the object is removed the solenoid will turn off automatically thus closing the supply of water. 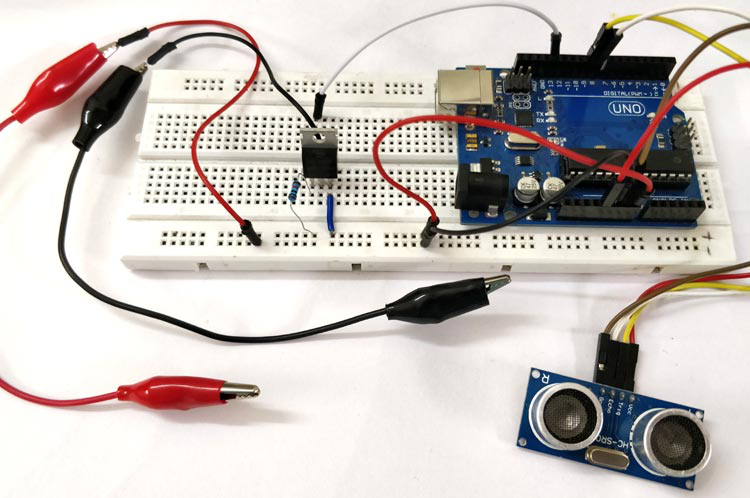 Learn more about using Ultrasonic sensor with Arduino here. The solenoid valve used in this project is a 12V valve with a maximum current rating of 1.2A and a continuous current rating of 700mA. That is when the Valve is turned on it will consume about 700mA to keep the valve turned on. 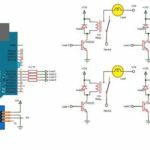 As we know an Arduino is a Development board which operates with 5V and hence we need a switching driver circuit for the Solenoid to turn it on and off. The switching device used in this project is the IRF540N N-Channel MOSFET. It has the 3 pins Gate, Source and Drain from pin 1 respectively. As shown in the circuit diagram the positive terminal of the solenoid is powered with the Vin pin of the Arduino. Because we will use a 12V adapter to power the Arduino and thus the Vin pin will output 12V which can be used to control the Solenoid. 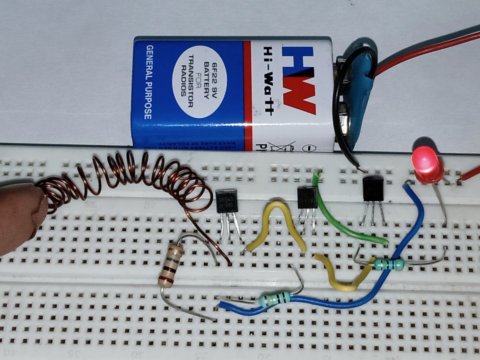 The negative terminal of the solenoid is connected to the ground through the MOSFET’s Source and Drain pins. So the solenoid will be powered only if the MOSFET is turned on. The gate pin of the MOSFET is used to turn it on or off. It will remain off if the gate pin is grounded and will turn on if a gate voltage is applied. 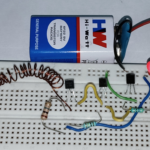 To keep the MOSFET turned off when no voltage is applied to gate pin, the gate pin is pulled to ground though a 10k resistor. 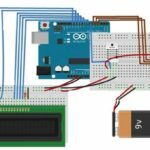 The Arduino pin 12 is used to turn on or off the MOSFET, so the D12 pin is connected to the gate pin through a 1K resistor. 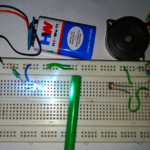 This 1K resistor is used for current limiting purpose. 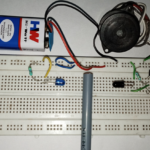 The Ultrasonic Sensor is powered by the +5V and ground pins of the Arduino. The Echo and Trigger pin is connected to the pin 8 and pin 9 respectively. We can then program the Arduino to use the Ultrasonic sensor to measure the distance and turn on the MOSFET when an object is detect. 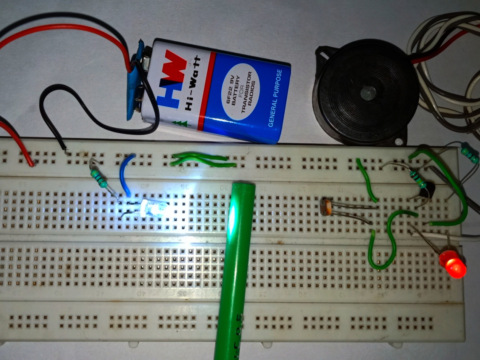 The whole circuit is simple and hence can be easily build on top of a breadboard. Mine looked something like this below after making the connections. 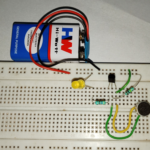 For this project we have to write a program which uses the HCSR-04 Ultrasonic sensor to measure the distance of the object in front of it. 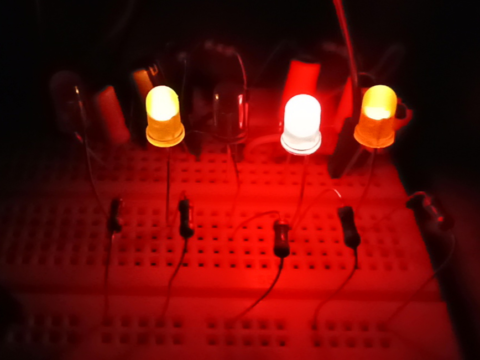 When the distance is less than 10cm we have to turn on the MOSFET and else we have to turn off the MOSFET. 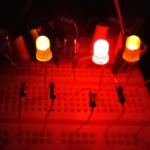 We will also use the on board LED connected to pin 13 and toggle it along with the MOSFET so that we can ensure if the MOSFET is in turned on or off state. The complete program to do the same is given at the end of this page. 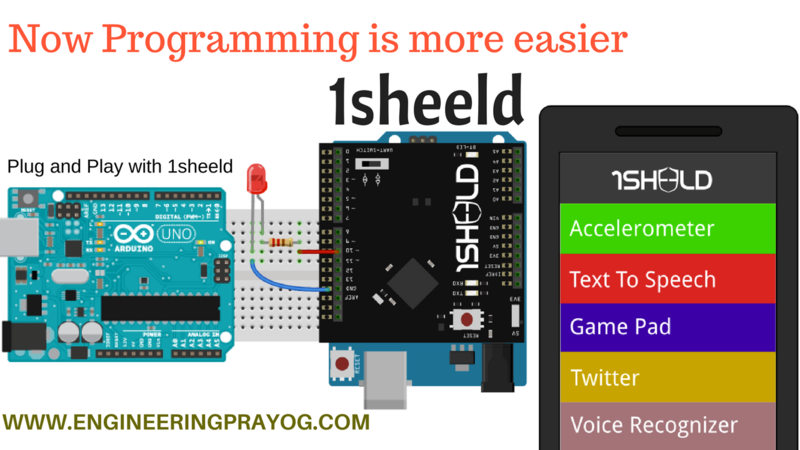 Just below I have explained the program by breaking it into small meaningful snippets. 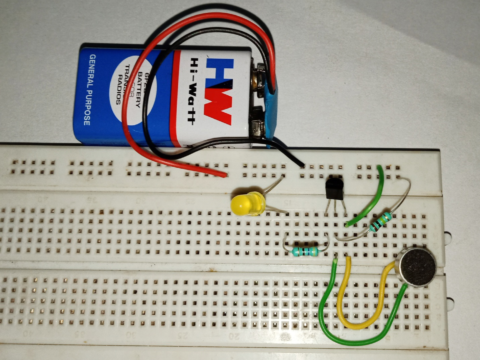 Once the distance is calculated, we have to compare the value of distance using a simple if statement and if the value is less than 10cm we make the MOSFET and LED to go high, in the following else statement we make the MOSFET and LED to go low. The program to do the same is shown below. HEY… you just made a automatic water despeser. now your this new creation will save some water. 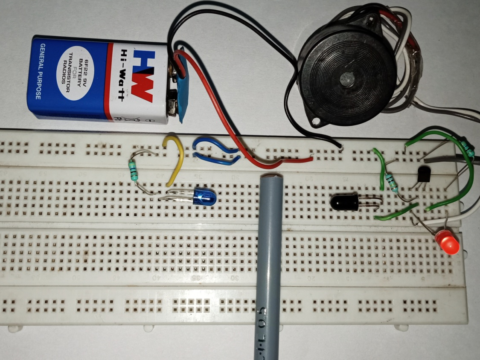 Previous PostGHOST DETECTOR CIRCUIT STEP BY STEP Next Post 1sheeld Tutorial know about its Working, uses and Features. This is Enamul Hassan, an Electrical and Electronics Engineer. I love discovering new things. 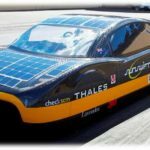 I share my knowledge in this blog. 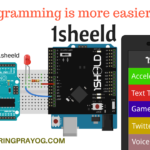 1sheeld Tutorial know about its Working, uses and Features.